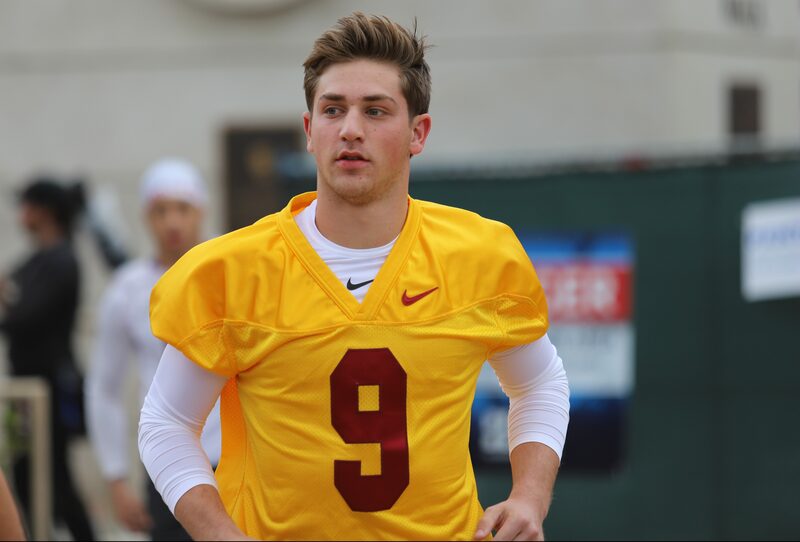 The ninth practice of spring ball for the USC Trojans saw some new faces making key plays, hard hitting matchups, and an aggressive and quick session, building momentum heading into the final days of spring ball. The Trojans continued practicing in full pads while participating in live tackling for the majority of practice. The physicality was matched by both sides of the ball throughout the day. The day started off with kickoff drills as place kicker Alex Staudthaus launched balls to live returners down the field. This drill did not see players aggressively hitting returners, only wrapping up or allowing the returner to flee out of bounds. The special teams transitioned from kickoffs to field goals quickly, as Staudthaus connected on a 25-yarder but missed when pushed back to the 30 yard line. Ben Griffiths continued performing well, as he launched balls from his own 25-yard line to somewhere between the goal line and the 15-yard line. Although his ball may not be the prettiest, it has an aggressive bounce that can pin opposing teams within short yardage of their own goal line. There was a pass block drill run between linebackers and opposing running backs. John Houston Jr. had a nasty push against Vavae Malepeai that sent him back a yard or two into the quarterback for this drill, which was running back coach Mike Jinks. It was interesting to see head coach Clay Helton specifically come to this drill and coach players up. Halfback Quincy Jountti had a great day at practice, capitalizing in the blocking and rushing/receiving drills. Jountti escaped through half of the defense running with the first team for part of the day. Stephen Carr also ran with the first team for the majority of practice, hitting holes and looking more and more like the potential starter for day one of fall. The receiving group had an interesting day as there were plenty of drops but also a select few highlight plays of spring ball so far. Amon-Ra St. Brown took a quick pass and raced almost 60 yards down the field for a touchdown. Devon Williams had some drops but also capitalized when it mattered most, grabbing two scores throughout the day. One interesting dynamic is the depth and production of the tight end group. While Josh Falo had a good day overall, tight end Erik Krommenhoek grabbed a ball for what was presumably a touchdown catch before fumbling it to the defense. Kedon Slovis (photo above) had an excellent day at practice today, running as the third quarterback up. Commenting on him post practice, coach Helton said that Slovis asked him if it was okay to go to his high school prom, emphasizing how young of a player he truly is. This young true freshmen certainly has a bright future wearing the cardinal and gold. QB Trevor Scully was out today, but remained on the sideline for practice. Talanoa Hufanga is out eight weeks with a re-injured collar bone injury, which he had successful surgery on earlier this week. Quincy Jountti had several nice runs throughout the day, going for 10 yards or more several times. Kedon Slovis connected with Devon Williams for a wide open touchdown grab on a slant in the endzone. John Jackson III had a nice breakaway on a short grab that saw him gain plenty of yards down the field. Stephen Carr had some nice plays up the middle of the offense, exposing the interior linebackers a few times.